In celebration of the Chicago Cubs' 2016 World Series Championship Big Time Bats has released a limited number of White W bats that will come signed by Cubs Relief Pitcher Carl Edwards Jr. The bats feature the iconic Blue W, the words "2016 World Series Champions," and all of the highlights of the 2016 season, including final Regular Season record, All-Stars, batting leaders, pitching leaders, and MVP award winners. Carl Edwards Jr. signed each bat, which is fully authenticated by MLB Authentics. Edwards was added to the team's Major League roster during the 2016 season and quickly established himself as an important part of the Cubs bullpen. He frequently hits the high 90s with his fastball. Carl Edwards Jr. 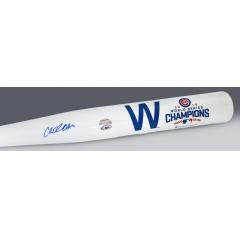 Signed Cubs 2016 World Series Champs "W" Bat $295.00 Sold Out!